We had a lovely jumble of magical treats from Cook the Books participants for this round celebrating Elizabeth Goudge's fantasy classic "A Little White Horse". I hope you will all find time to visit everyone's posts below and enjoy reading about favorite book images and characters as much as I have. The homey, yet abundant spreads that Moonacre Manor Head Cook Marmaduke Scarlet prepared were an inspiration for a lot of kitchen creativity (and probably many sinks full of dirty dishes and pans) which would certainly make a delightful and filling afternoon tea, especially if one has a sweet tooth. Foodycat, an Aussie transplant in England who suggested our featured book, reread "The Little White Horse" for the umpteenth time, and summarized its appeal as follows: "For me it is a comforting story, from the days before there were worries, when good would triumph and it was perfectly natural for a bossy 13-year old to confront evil-doers with God on her side." Foodycat was taken with the hominess of a pork chop dinner that Sir Benjamin and Miss Heliotrope devoured while our heroine, Maria Merrywether, comes home somewhat storm-bedraggled. She meditates on their bones and scraps and wonders why they didn't worry about her or tuck away an extra helping for her. Indeed. You may salivate over this delectable plate of Pork Chops with Sage, Apple and Onion here. For those who hanker after more of Goudge's writing, Foodycat recommends reading "Linnets and Valerians". 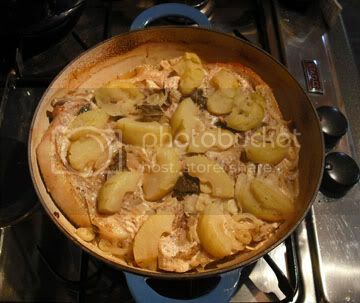 Back in Australia, Foodycat's own mum, The Cat's Mother, describes "The Little White Horse" as literary comfort food and was moved to recreate the meal that young Maria and Miss Heliotrope received when they first arrive at Moonacre Manor after a long and jolting carriage ride from London. The Cat's Mother was a guest blogger on The Crispy Cook where you can read her bookish blog post and savor the details of her cozy meal, featuring Leek and Onion Soup, a homemade crusty loaf with organic butter and honey, Chicken Stew, Baked Apples, all washed down with a bottle of claret. That would certainly be a welcoming meal to make anyone feel right at home. Another Aussie joined us in reading and eating our way through this round of Cook the Books: Suzie of Munch + Nibble prepared some Strawberry Sponge Kisses to present to Maria and Robin, " something light and dainty as the kiss of Loveday Minette" which she would serve forth with strawberry tea. These confections are light cakes, split and filled with strawberries and whipped cream and then allowed to soften for three hours before eating. As Suzie notes, one is tempted to skip the softening step and start devouring these kisses. Something sweet and pink was also on the mind of my fellow Cook the Books founder, Jo of the Greek blog, Food Junkie not Junk Food. Jo found Goudge's descriptions of the English countryside enchanting and was taken with Maria's appreciation of the love and care expressed by a blue wooden box full of frosted cookies (biscuits) awaiting her in her new Moonacre Manor bedroom. Jo recreated these welcoming treats with a recipe for Moon Princess Biscuits, luscious vanilla-scented, heart-shaped cookies iced with pink frosting. My other Cook the Books founder buddy, Deb, of the Hawaiian blog, Kahakai Kitchen, was impressed by the territorial Marmaduke Scarlet, and his ability to whip out an "endless array of British food". She decided to research how to make syllabub, a frothy and sweet old English dessert/drink (depending upon how thick a consistency one beats it to, I guess). 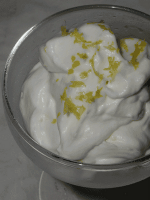 Deb found Nigella Lawson's recipe for Turkish Delight Syllabub and whipped up a lovely batch of this as her contribution to our repast. Hawaii is also the home of Claudia at Standing Straight, who fancied a Ginger Cake made with Guinness Stout after reading Goudge's descriptions of the many items prepared for the reconciliation tea Marmaduke prepared at the end of the book. Claudia was so pleased with how it turned out that after sampling the first Cake, she decided to bring another to a wedding reception. Ginger was also on my mind after reading "The Little White Horse". I loved Marmaduke's bossiness and his litany of teatime goodies that he tossed off while planning the ultimate tea party. 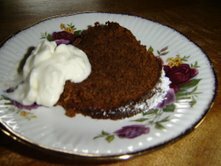 The idea of Parkin, an oaty, dense gingerbread that gets stickier and better with age, particularly beckoned me, and I made a panful of this hearty, spicy treat which we've enjoyed for the last week at our own, more spartan afternoon teas. Two other New Yorkers joined me with Cook the Books posts. The first was Arlene from The Food of Love, who made a plate of Fairy Cakes. Arlene is a former English teacher who was familiar with many of the Britishy food items described in the book, but fairy cakes were something she had to research and found divergent interpretations of what a proper Fairy Cake should be (smaller than cupcakes, having inside fillings, etc.). She riffed on a recipe from British food blog Becks and Posh and made a tray of these airy confections, only to find that some had "magically" vanished on the counter overnight. 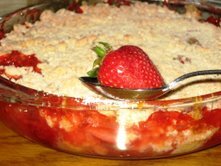 Joanne of Eats Well With Others is our other New York representative, and she found Marmaduke's character doubly inspiring for her Strawberry-Rhubarb Crumble. The bright scarlet color of the dish was obvious, but Joanne also felt that the symbolism of having tart rhubarb and sweet strawberries join together in this dessert was appropriate for a peaceful feast between the previously warring Sun and Moon Merrywether clans. The euphoniously-named character of Loveday Minette and her love for all things pink, especially pink geraniums, inspired Natashya of the Canadian food blog Living in the Kitchen with Puppies. Natashya not only made up a grandly colored batch of Lovely Pink Yogurt, frozen and spiked with strawberry liqueur (whoa! ), but charmed her way into the flower garden of a previously-unknown neighbor to photograph her pink geranium blooms. 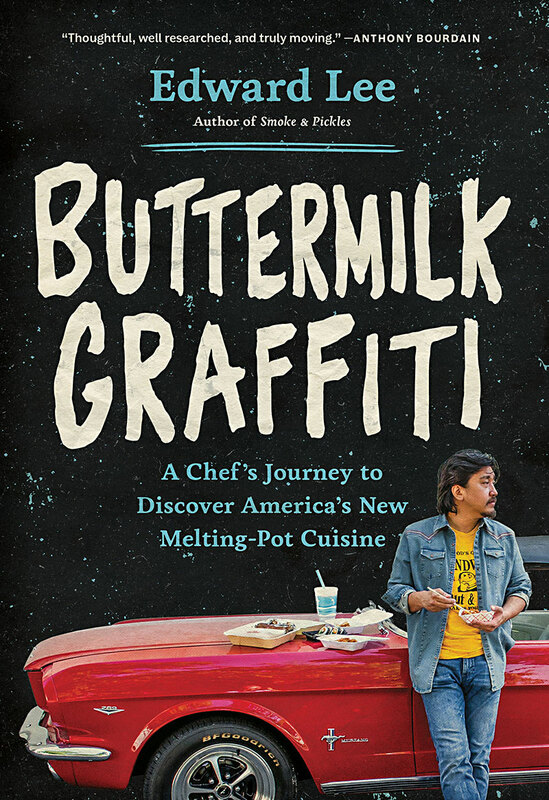 Californian Judy of Gross Eats found Goudge's book an irresistible, lovely and mystical fantasty and made two dishes for a "Little White Horse" meal. She joined Foodycat in her appreciation of the toothsome Pork Chops with Onions and Apples that Miss Heliotrope and Sir Benjamin dine upon during Maria's absence. As if that wasn't decadent enough, she topped this with a Limoncello Syllabub for dessert. Fellow Californians Bruce and Glennis of Can't Believe We Ate were inspired by the book to investigate the world of scones. Glennis took the plunge into scone making with Blueberry Scones with a Lemon Glaze and found that they were perfect with a cup of coffee while watching the horse races. Simona is an Italian expat living in the U.S. and has a very informative food dictionary blog, Briciole. She enjoyed the book and found comparisons to prayer poems by St. Francis of Assissi and selections from Goudge's novel which are very interesting to read. Inspired by Marmaduke's baking prowess, she too, ventured into the world of Scones and made several small batches with blueberries and raspberries. Simona is the host of Novel Food, a semi-anual blog event that also celebrates books and the culinary creations inspired by them, with the difference that participants dip into any novel, play, poem or short story of their choosing. The deadline for the next Novel Food round is July 18 and you can find out more details on Briciole. Our final contribution to this virtual feast comes from Heather, the Girlichef in Indiana, who identified with Marmaduke Scarlet's admonition to Maria that great occasions need to be greatly celebrated when questioned about his long list of foods to be prepared for the Sun and Moon Merrywether tea. Heather ruminated about many ideas to concoct for Cook the Books and finally settled upon an elegant bowl of Candied Cherries, as spied by Maria at Moonacre Manor. Crunchy candied cherries sounds like the perfect bite to conclude our virtual feast. I trust that after viewing all these scrumptious posts you all are deliriously sated. Deborah Gaudin of the Elizabeth Goudge Society has graciously agreed to review our posts about "The Little White Horse" and will be choosing one to crown as the winning entry. I will let you all know her verdict as soon as possible. I am so happy to see others enjoyed this delicious little novel and found time to cook up some delightful treats. If I inadvertently left anyone's contribution out of this roundup, please let me know and I 'll add you to our feasting table immediately. Jo, Deb and I are pleased to announce that Deborah Gaudin of the Elizabeth Goudge Society will be judging the Cook the Books blog posts about "The Little White Horse" after our June 26 deadline. The Elizabeth Goudge Society website is chock full of interesting articles, interviews, tidbits and links about Goudge and her books, so I would encourage you to visit this informative site to find out more about our featured author. I particularly enjoyed reading Ms. Gaudin's analysis of the prose style and symbolism in "The Little White Horse", and found it to be an inspiration for my upcoming blog post. Ms. Gaudin feels that the many food references, particularly involving teatime sweets, derives from the rationing and World War II austerities that Great Britain endured and that these descriptions were and are particularly appealing to sugar-loving children....of all ages. Indeed. Looking forward to your enchanting posts about our featured book!